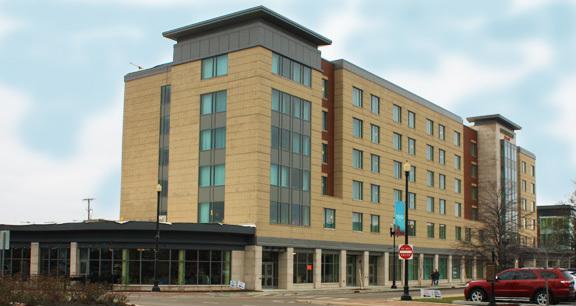 Project obstacles and solutions: The Courtyard Hotel in Muncie, Indiana may look like a typical Courtyard by Marriott at first glance. However, the newly constructed hotel merges two innovative ideas that meet immediate needs. First, it is located adjacent to the Horizon Convention Center. Previously there was no overnight accommodations near the convention center. The construction of the hotel helps expand the city's ability to draw in larger convention business. Second, the Courtyard houses the ARC of Indiana's Erskine Green Training Institute. ARC of Indiana assists disabled people to work in the hospitality, food service and health care industries. The hotel and the Thr3e Wise Men restaurant, located in the hotel lobby, plus the IU Ball Hospital will provide ready-made jobs for Erskine Green students. The joint venture between General Hotels of Indianapolis, the ARC of Indiana Foundation, in collaboration with IU Health and the City of Muncie, is the first of its kind. This project was at the heart of revitalizing the downtown area of Muncie. The hotel was built with six floors and 125 rooms. There was considerable pressure to open the hotel on time. The hotel and restaurant were to be operational by December 2015 in time for the Christmas holiday. The school was scheduled to start classes in early January 2016. IMI supplied over 5,000 yards of concrete for the foundation, floors, walls and elevator shafts of the hotel. The project began in the dead of winter, so mix designs were adjusted for the cold temperatures. To keep the job moving, IMI provided concrete delivery around the clock. Garmong engineers required that the concrete meet a 48 hour strength of 3,000 psi. IMI QC/QA provided a concrete mix that incorporated a high range water reducer and consistently made the 3,000 psi early strength in 24 hours - half the time required. The Courtyard by Marriott Muncie at Horizon Convention Center opened in time for the Christmas season. The Erskine Green Teaching Institute will begin classes on January 11, 2016. In 2016, this project was awarded an Outstanding Concrete Achievement Award from the Indiana Ready Mix Concrete Association for a commercial building. For more information on early strength in concrete, contact the sales representative nearest your locaton. Click here.